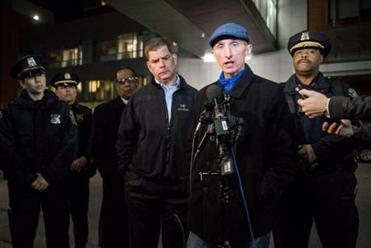 Police Commissioner William B. Evans, a South Boston native who championed a new vision for community policing and played a key role in the pursuit of a Boston Marathon bomber, said Monday that he will retire after 38 years with the force. In a historic change of guard, his second-in-command, William G. Gross, was named as his replacement and Boston’s first black commissioner. Evans, 59, turned emotional as he announced his departure at a City Hall news conference, saying that after five years on the round-the-clock job, it was time to spend more time with his family. Beginning Aug. 6, Evans will run the public safety department at Boston College. Mayor Martin J. Walsh, who appointed Evans in January 2014, noted the milestone moment for the Boston Police Department. The longtime officer and top police official is expected to announce his retirement Monday. “We’re losing an incredible leader today and bringing in someone right behind him who’s an incredible leader,” Walsh said. Under Evans’s watch, the department expanded community policing beyond having officers attend neighborhood crime watch meetings. They started to personally engage residents, especially at-risk children. Officers played in basketball tournaments, and took Zumba classes with residents. Evans was a regular at peace walks, flashlight walks, and after-hours tours through neighborhoods. Building off the lessons of the Boston Miracle that helped combat gang violence in the early 1990s, Evans had a regular rapport with black clergy leaders, who often served as contacts with the community. At Boston College, Evans will succeed John M. King, who is stepping down after leading the public safety department at the Newton campus for the past eight years. “Bill Evans’s extensive experience and his understanding of BC’s commitment to student formation make him an ideal choice to lead our department,” John Burke, the college’s financial vice president and treasurer, said in a statement. Evans was paid a $230,000 salary in 2017, according to city records. Boston College did not disclose his new salary. The youngest of six brothers, one of whom died young, Evans lost his parents at a young age — his mother died of cancer when he was 3, his father died of a heart attack when he was 14. He credits community members, including his church pastor, with helping him through his career. Evans started as a police cadet on July 9, 1980, and became a patrol officer in November 1982. He spent five years as a patrolman, and he was awarded the force’s Medal of Honor for his role in capturing an armed robbery suspect following a high-speed chase. He eventually served in every civil service rank in the department. His brother Paul served as commissioner from 1994 to 2003. In an interview, William Evans said one of his most memorable efforts as an officer was the week of April 15, 2013, when he led the tactical team that tracked down and apprehended Dzhokhar Tsarnaev, the lone survivor responsible for the Boston Marathon bombings. Evans, an avid runner, had completed the Marathon before the bombings. Four days later, he took command of the scene at the boat in Watertown where Tsarnaev was found and quelled gunfire during tense moments to secure Tsarnaev alive. But Evans also highlighted the everyday work of officers who, he said, have helped to uplift Boston’s reputation at a time when community and police relations soured in many cities. The recorded shootings of unarmed civilians, mostly black, by officers had caused growing distrust in communities. That unrest was not seen in Boston, supporters said, largely because of Evans’s relationship with community and clergy leaders: He would meet with them and introduce evidence of a shooting, an effort to keep the community informed. When white nationalists and their supporters planned a “free speech” rally in Boston last year, and counterprotesters responded with a crowd of 40,000, Boston police communicated with both groups, and the event went off largely without incident. Evans said that same strategy was also key in the city’s response to Occupy Boston in 2011, when some 100 protesters settled into a tent city downtown to protest national economic policies. After 70 days, officers forcefully removed the protesters. But over time, Evans said, both parties had claimed a mutual respect for each other. He hands over the reins of a 2,200-member department that, by many accounts, continues to build community relations. From 2013 to 2017, according to police figures, crime such as robberies and assaults dropped 18 percent, while the number of arrests fell 23 percent. Meanwhile, the department has seen a 42 percent decline in the number of internal affairs complaints against officers and a 46 percent drop in officers’ reported use of force. Homicides reached a 15-year low in 2015, when there were 40 killings. But they increased in 2016 to 46, and to 58 last year. So far this year, the city has seen 30 murders, two more than this time last year, though the total number of shootings is down 27 percent. One of the city’s challenges, Evans said, is providing youth of the city with opportunities to turn away from street violence — opportunities like ones he had growing up in Boston, after the death of his parents, being raised by brothers. Jerome Campbell of the Globe staff contributed to this report. Milton J. Valencia can be reached at milton.valencia@globe.com. Follow him on Twitter @MiltonValencia. John R. Ellement can be reached atellement@globe.com. Follow him on Twitter @JREbosglobe.